This page is designed to help you identify desert wildflowers by color, scientific name, region and common name. Click on the color listed below, to view the wildflower pictures sorted by color. 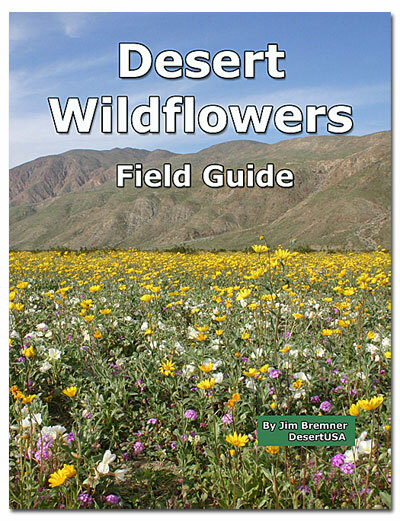 Get the Desert Wildflowers ebook for your Kindle or iPad. Wildflower ebook for your Kindle, iPad or Smart Phone - Identify the wildflowers while out in the desert with our wildflowers field guide. When will the wildflowers bloom? To plan your visit to coincide with the peak of the bloom, keep up to date with DesertUSA's Wildflower Reports. Be sure to bookmark the page for weekly updates. We'd like to see your pictures too. Send your pictures and reports to Jim@desertusa.com. We will post them on the wildflower reports site so that everyone can enjoy the wildflowers. Please use Wildflowers in the subject line on your email to us. We use this subject to make sure we are able to spot your email. Wildflower Update: What's in Bloom This Week?